Here at Vann York Honda, we offer new Honda automobiles for sale. Our helpful Honda dealership is here to help you and your family find a vehicle you can rely on. If you are in the market for a new SUV near Kernersville, NC, we invite you to visit our local Honda dealer. 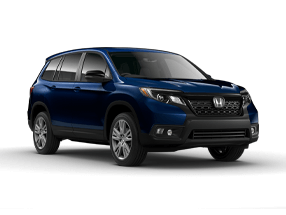 We'll tailor a 2019 Honda Passport SUV buying experience that is curated to your budget and wants. Our Honda sales associates know the standard and available features on the full trim line. When you're ready to take hold of the paddle shifters, blip through all nine speeds, and command 280 Horsepower, schedule a Passport test drive. The 2019 Passport arrives with Honda Sensing® standard across all trims. This package of advanced safety and driver-assistive technologies is designed to help you avoid potential hazards you might miss on the streets of Greensboro, NC. Notable systems include Road Departure Mitigation System, Lane Keeping Assist System, Adaptive Cruise Control, and Collision Mitigation Braking System™. Discover more! If you are looking for a new SUV that performs in mud, sand, and rugged terrains then you can stop looking. The 2019 Passport is here. Weather and road conditions shift. You need a vehicle that can keep up. The new Honda SUV comes with Intelligent Traction Management. This feature allows drivers to adjust between Mud, Sand, and Snow modes with available all-wheel-drive. If those weren't reason enough to take home a new Passport, the fuel economy numbers put it over the top. Enjoy an EPA-estimated 19/24 MPG (City/Highway) while making your way to and from Winston-Salem. Vann York Honda welcomes High Point area drivers to find the trade-in value they're looking for. Start the process of selling your used car for cash right here on our website. To appraise your car, discover the value of your trade-in. When you are ready to drive home a new Honda Passport to your front door, take these directions to our local Honda dealership.